As we gather our forces to end Winter and begin the Spring hunting season for vintage collectibles, we ready for the heat and to helprovide it we offer you a CAPTAIN GALLANT of the FOREIGN EGION special event issue, with MORE color and MORE pages! This issue showcases the French Foreign Legion as we delve into the mysteries of Lido, Rel, Payton, Starlux and many other makers, some startling in their collectibility or realism. 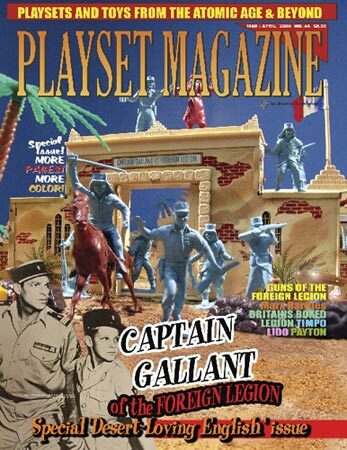 And of course we offer the most complete coverage ever fro the Marx Captain Gallant of the Foreign Legion playset, with extra color pages to bring you u p close and personal to the exotice desert setting for the Arab Sheik's Encampment and the lonely fortified outpost of Captain Gallant, Cuffey, and all his men. The Offical Marx Museum joins us to provide excellent historical coverage featuring for the first time ever, original factory records on this magnificent playste! Plus you'll find the instruction,s lore and nuances that make this set legendary. Next we're off with "Those Desert Loving English" for a brilliant look at Britains' Herald Foreign Legion boxed sets and the Timpo colorful Swoppets, plus those delicious solid plastic colors that made them famous in the late 50's and early 60's. You thought there was more and you are right! 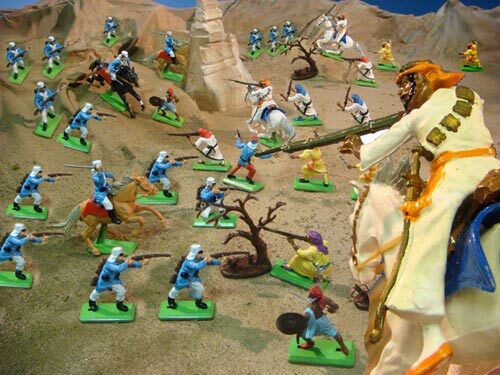 Airfix' Foreign Legion complete with Airfix Fort, Captain Gallant gun set, hats ad collectibles provide a heady ramp up to our usual hobby news, classified and display ads -- your very best source for guaranteed vintage toys -- and lots more! So be sure to join us for this, Issue 44 and our Captain Gallant Special Issue!